To be the Four Great Ancient Civilizations, Chinese culture has always been concerned by many Western countries, like Chinese profound history, Economy Development, Chinese culture and Chinese delicious cuisines, westerners would be surprised when they see the dinner for a table of eight people consists of four courses of cold dishes, four courses of hot dishes, coupled with soup and steamed rice. The most special thing is they eat with chopsticks. Chopsticks play the most important role in Chinese cuisine culture. Chinese people have used it as the main tableware since 3,000 years ago. Chopsticks can be made of different materials, such as ivory, bronze, gold, silver, wood or bamboo. In history, sliver chopsticks could be used as the detection of poison in food. 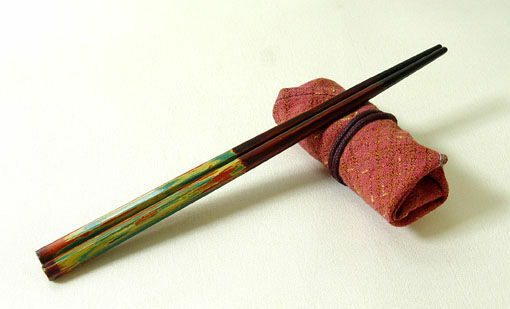 Today, wood or bamboo chopsticks are the most popular in Chinese daily life. It is believed that using chopsticks would make people more adroit. Chinese banquet has a strict rule about seat order. Sitting at left or sitting at east is a better seat than sit at right or sit at west. Generally speaking, the seat facing to the door is prepared to the host. The most important gust is usually arranged to sit on the host’s left, while the second important gust is arranged to sit on the host’s right. Shaanxi Cuisine, also known as Qin Cuisine, is the representative culinary achievement in the northwest China. The history of Shaanxi Cuisine is said to be as long as the national's civilization, retaining the table characteristics of the Qin, Han and Tang dynasties. At present, the Cuisine has been divided into the Guanzhong (central Shaanxi), Shannan (south Shaanxi) and Shanbei (north Shaanxi) cuisines according to their geographical locations. Xi’an, located in Northwestern China, has its own taste, which would be one of the highlight of your trip in Xi’an, so a self-service trip to Xian is necessary. Also traveler can book a trip to taste local delicious food paradise with your tour guide. The traditional Xi’an food can be a diamond of Shaanxi Province. It is honored as the “most tasty dish” in Changan(the ancient name of Xian) which has been populated for thousands of years. The traditional Shaanxi special dishes with soaked sea slug and squid as its main make-up, bears both wonderful taste and great nutrition. This dish in fact keeps its fame and position in many Chinese cuisines; it is fat but not greasy, which really is worth a try. This dish has beautiful look and good nutrition, meanwhile, a long history---more than 300 years. It has been popular from Tang Dynasty, representing wealth with its copper cash shape. Pan Fried Dumplings called Guo Tie in Chinese, is the sister food of fried dumplings. It is a popular staple food throughout China. The Pan Fried Dumplings are made of a simple flour wrapper filled with various fillings like pork mixed with all kinds of seasonal vegetables like cabbage and celery. The shapes differ from area to area: most are pouch-shaped in Tianjin style, and in crescent like Chinese dumplings. Xi'an is crazy for noodles -- from narrow to wide, from cold to hot, from egg noodles to spinach noodles -- as long as they're hand-stretched. Biangbiang noodles are famous mostly because of their unique name. Biang is the most complex Chinese character, with 58 strokes. The word is onomatopoetic: It mimics the sound of flour dough hitting the counter when being stretched. The noodles, named one of the "10 strange wonders of Shaanxi", is described as thick and wide as a belt (similar to pappardelle). They're also very long -- one noodle can easily fill up a whole bowl. The noodle is very savory and chewy -- thanks to the eggs and oil added in the flour dough. The most common Biangbiang noodles are often served with vinegar and topped with lots of red-hot peppers, diced garlic and boiled baby bok choy. Heated oil will be added before serving. A fancier version would be topped with braised meats and assorted vegetables. Roujiamo is like a hamburger, but with a much longer history. There are just two critical elements for a roujiamo -- baked leavened bread and shredded braised meat. A good jiamo should be baked using a traditional furnace instead of an electric oven. Meat -- usually a mixture of fat and lean pork that has been braised for hours -- should be hand-shredded and pocketed in the bread. There is also a choice for lean-meat-only pork jiamo -- a little chewier than the usual ones. You will be asked to break the unleavened bread into a bowl. The trick is to break the bread into the smallest pieces possible before it is taken to the kitchen to be filled with the mutton stew. This task may prove to be hard on your fingers, but once you have prepared your bread, you pass your bowl to the chef who will stir it into a pot of hot mutton soup. After five to ten minutes, he will ladle the soup and bread back into your bowl with a quantity of mutton, adding chilli paste, caraway and a specially salted sweet garlic to enhance the dish. Provide a warming energy boost, this delightful stew is best experienced at Lao Sun Jia and the Tong Sheng Xiang restaurants, where they have been serving it for over a century. For those who aren't mutton fans, you can instead ask for it "niu rou" – a version served with beef instead of the traditional meat. Liangpi is typically made from rice flour that is mixed with water and, depending on the variety, washed until only the gluten remains. The pancakes are steamed, cooled, cut into thin strips and placed into a bowl with julienned cucumber and bean sprouts. The dish is then layered with a variety of different sauces and the final result will depend on where you go, as each outlet has its own special recipe. The additions vary vastly, but typically include vinegar, salt, chilli oil and smashed garlic in water. How to make the sause? Tangbao is also very famous food in Xi'an, the people in Xi'an will let you know they have the better tangbao than Shanghai, since most people in the world would call tangbao (soup dumplings) a Shanghai special. The Xi'an version with lamb or beef -- instead of pork like its Shanghainese counterpart -- wobbling inside paper-thin wrappers is sheer heaven for locals, and possibly for everyone else. The city even has its own special vinegar and chili dip for having with its tangbao. And be careful not to burn your mouth -- the soup inside is extremely hot. The jiaozi is Chinese traditional cuisine both in Xi'an, and it has been well known for all of the worlds, Jiaozi is not only have the high status in Xian, but also in all of the Chinese people's heart, jiaozi means reunion and happiness. 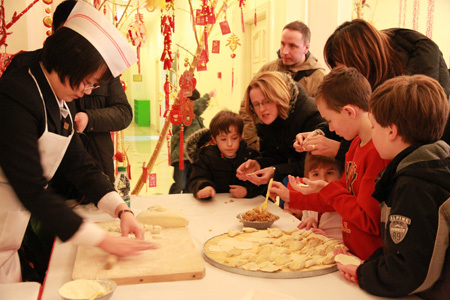 The Chinese dumpling has a long history and is an essential part of celebratory meals such as those prepared for the Chinese lunar Spring Festival, and the jiaozi should be the must-eat in China. This is the food that Chinese people all enjoy to make it in their family partys. How to make dumplings skin and how to make dumpling recipes? 1. Stir the salt into the flour. Slowly stir in the cold water, adding as much as is necessary to form a smooth dough. Don't add more water than is necessary. Knead the dough into a smooth ball. Cover the dough and let it rest for at least 30 minutes. 2. To make the dumpling dough: knead the dough until it forms a smooth ball. Divide the dough into 60 pieces. Roll each piece out into a circle about 3-inches in diameter. 3. Place a small portion (about 1 level tablespoon) of the filling into the middle of each wrapper. Wet the edges of the dumpling with water. Fold the dough over the filling into a half moon shape and pinch the edges to seal. Continue with the remainder of the dumplings. Sweet-scented Osmanthus cake is a traditional sweet-scented Chinese pastry made with glutinous rice flour, honey sweet-scented osmanthus and rock sugar. It has crystal clear, sweet and soft waxy characteristics.